Voles are small mammals, commonly called mice, that live in field and shrub habitats. In the wild, voles forage on native vegetation and provide a valuable food source for predators such as weasels, hawks, and snakes. In orchard and nursery plantings, however, voles can cause economic damage by girdling the trunks and roots of woody plants. Vole damage can kill a tree outright, allow diseases to enter, or weaken the tree, resulting in decreased fruit production for the life of the tree. The estimated annual loss from vole damage to apple growers in North Carolina is $2.5 million. Nursery operations also sustain significant losses. In their wild habitats, vole populations do not need to be controlled. In commercial orchards and ornamental nurseries, however, vole damage must be controlled to preserve profitability. Some of the control strategies currently available for voles (that is, certain types of rodenticides) can be hazardous to nontarget wildlife such as birds and mammals and to humans. Therefore, it is important to select a control strategy that poses the least hazard to the environment (for example, integrated pest management). There are two kinds of voles in North Carolina, the pine vole (Microtus pinetorum) and the meadow vole (Microtus pennsylvanicus). Both of these can cause damage in orchards and ornamental nurseries. Physical characteristics. Pine voles have small eyes and ears that are hidden by their fur. The tail is shorter than the hind legs. The fur is reddish brown. The adult pine vole is about 3 inches long and weighs 1 ounce or less. Reproduction. Female pine voles have a gestation period of 24 days, have an average litter size of 2.8, and produce four to six litters per year. They reach sexual maturity at 37 to 38 days and have a reproductive life span of 15 to 18 months. Ecology. Pine voles spend most of their lives under the ground in burrow systems. They feed on plant roots, flower bulbs, and the growing tissue (cambium) of tree roots. Pine voles tend to stay in an area as small as 1,000 square feet for their entire lives. At night, they come above the ground and feed on fruit and tender green vegetation. Soils with substantial clay content are more likely than sandy soils to support pine vole populations because the clay in soils permits relatively permanent tunnel systems and nest chambers. The typical natural habitat for voles is the shrubby edge between the woods and meadow openings. Physical characteristics. Meadow voles' eyes are not covered by fur, and their ears (partly covered by hair) are also visible. The tail is longer than the hind legs. Their fur is dark brown, often silvery on the underside. The adult meadow vole ranges from 3.5 to 5 inches in length and weighs 1 to 2.5 ounces. Reproduction. Female meadow voles have a gestation period of three weeks, have an average litter size of five, and produce four to five litters per year. They reach sexual maturity at 40 days and have a reproductive life span of 1 to 2 years. Ecology. Meadow voles spend most of their lives above the ground, living in and feeding on grasses. They have larger home ranges than pine voles and may travel as far as 1⁄4 mile in a week. The typical habitat for meadow voles is a grassy meadow, particularly in places where the grasses grow in clumps. Tall fescue in orchards and lightly grazed pastures are typical habitats. It is important to be alert for signs of vole damage in the orchard. If vole activity is detected, the nature of the damage will reveal the type of vole present. As discussed later, that information is essential in selecting a control strategy. Pine voles damage trees and plantings below the ground (Figure 3). When the damage to a particular tree, shrub, or broad-leaved plant is extensive, the plant will be severely weakened and may die. The trunks of small trees or shrubs may be severed from the roots, making it possible to pull the top of the plant out of the soil. 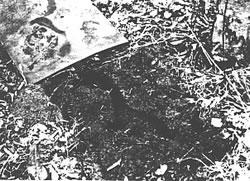 Upon close inspection of the plant, gnawing marks can be seen just under the soil line. In orchards, the damage to the tree may not be sufficient to kill the tree, but damaged trees produce less fruit and may not be profitable. Careful observation beneath the tree may reveal piles of earth (3 to 4 inches wide) and tunnels that are about 11⁄2 inches in diameter. Look under the tree for hollow shells of apples, eaten from the underside. If pine voles are living under the tree, a network of tunnels approximately 3 inches under the soil can be located by probing with a 1⁄2- to 3⁄4- inch- diameter stick or rod. Orchard and nursery managers who suspect that pine voles are in their plantations can determine the extent of the population by conducting the apple sign test discussed in the next section. Signs of meadow voles are found mostly above the ground (Figure 3) in taller grasses and cover. Look for trails in the grass and grass clippings, and check for feces at the base of large clumps of grass. The feces may be brown or green in color, are shaped like grains, and are frequently left in small piles. Meadow voles girdle trees and saplings at the ground line. Close inspection of the damage will reveal paired grooves left by their chisel-like teeth. The grooves will be about 1⁄16 inch wide. Girdling completely around the tree trunk will kill the tree, so any indication of above- ground damage is cause for instituting a control program. Rabbits also chew on young trees, but the girdling begins several inches above the soil line. Rabbits have much larger incisor teeth than voles, which will be reflected in the size of grooves on the girdled tree. Rabbit damage can be controlled with a plastic tree guard, but these devices will not prevent meadow vole damage. Sound principles of integrated pest management (IPM) require that pest populations be monitored before any control measures are taken. Growers can use the apple sign test to determine the locations of vole populations in the plantings. Control measures can then be restricted to those locations. Developed in Virginia, the apple sign test has been verified at the Mountain Horticulture Crops Research and Extension Center at Fletcher, North Carolina. This test for voles is inexpensive and does not require much time once the monitoring stations are established. To conduct the apple sign test in an orchard or nursery, a total of 30 monitoring stations should be established per acre, as outlined below. Stations should be concentrated wherever woods and old fields adjoin plantings, as well as scattered throughout large plantings. Records or memory of locations where vole damage occurred in the past can help you choose monitoring locations. Step 1. Prepare 30 1- foot- square shingles per acre. Sketch a map showing the locations of trees or shrubs. This sketch (and copies of it) will serve as your recording sheet. Step 2. For each acre, identify three rows of trees or shrubs and place 10 shingles per row about 30 to 40 feet apart. Select seedlings or shrubs that are the same age, have the same type of vegetation or ground cover, and have approximately the same drainage slope. If monitoring for pine voles, place the shingle over a vole hole, if one can be found, or on bare soil. If monitoring for meadow voles, the shingle must be rounded in a tent- like fashion or propped up 3 to 4 inches off the ground so that the animal can go under it. Mark the location of the shingles on the map drawn in step 1. Step 3. After 5 days, place a 1/2- inch cube of apple under each shingle. After 24 hours, check whether or not the apple has been removed or eaten. On the map prepared in step 1, mark a simple + (to indicate that voles are present) or - (to indicate that voles are not present). Leave the shingles in place for future monitoring (Figure 4). Step 4. When monitoring has been completed, you can determine the locations where vole damage is occurring and can direct control activities to those areas rather than treating the entire planting. Step 5. File the recording sheets with the dates of monitoring and the locations of control measures. Step 6. Conduct the apple sign test in the fall and spring each year and 21 to 30 days after each rodenticide application. Trapping is an effective way to determine if one or both kinds of voles are present. A snap-type mouse trap used with a small piece of apple for bait works well. The trap should be placed under a shingle. To trap pine voles, some excavation will be needed to place the trap down in the run. Place the trap at a right angle to the run. Bend the shingle to form an arched roof over the trap so that the spring will clear the shingle (Figure 5). Meadow voles can be caught by setting traps at right angles to their runways in the grass. No excavation is necessary because meadow voles live above ground. Figure 4. Tunnels made by pine voles under a shingle at an IPM monitoring site. Currently, there are no alternatives to rodenticides for control of pine vole populations in commercial orchards and nurseries. Careful and routine application of the apple sign test will reveal the locations of pine vole activity. Rodenticides should be applied only in those areas. After control measures have been taken, the apple sign test should be repeated. The test should be conducted as a regular practice at least twice each year, once in the fall and once in the early spring. There are two alternative control strategies for meadow voles. First, if the damage is extensive, immediate treatment of the planting with a rodenticide may be necessary. Second, following successful rodenticide treatment, you can reduce or remove grass thatch to deter meadow vole populations. In mature orchards, a 4- foot grass- free strip on each side of the tree row is recommended, but narrower bands may be used on steep slopes to reduce soil loss. Close mowing will also prevent meadow vole populations from becoming established. In North Carolina, the three rodenticide compounds labeled for vole control are zinc phosphide (ZP Rodent Bait AG), chlorophacinone (Rozol Paraffinized Pellets, Parapel, and Rozol Ground Spray), and diphacinone (Ramik Brown). Zinc phosphide is acutely toxic to all vertebrates and therefore presents risks to nontarget wildlife in the orchard as well as safety risks to people. Chlorophacinone and diphacinone are much more toxic to rodents than to other mammals or birds. When used according to label directions, the risk to nontarget wildlife from chlorophacinone or diphacinone pellets is minimal. Of the two pelleted forms of chlorophacinone, the paraffinized pellets are smaller, are better suited to broadcast application, and result in excellent control of pine vole populations. Both chlorophacinone and diphacinone pellets are formulated at 0.005 percent active ingredient and have a safety code of C, meaning that they are relatively safe when handled according to label instructions. When placing by hand, select areas of pine vole activity and place the baits in the runways, such as under the shingles used for the apple sign test. The application rate for hand placement is 10 pounds per acre. A second application is recommended 20 to 30 days after the first. For mechanical broadcast applications, the rate is 20 pounds per acre. The pellets must be broadcast into vegetative cover, not onto the bare ground. 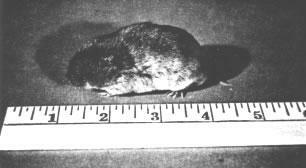 For meadow vole control with diphacinone, the application rate for broadcast and hand placement is 10 pounds per acre. Chlorophacinone ground spray is formulated as a 5.34 percent emulsifiable concentrate (EC) and has a safety rating of D, which means that the risk of poisoning to the operator is sufficient cause to take more precautions than for pellets. The spray is applied at 1 pint per 100 gallons and 600 gallons per acre. Pellets are likely to provide better control of pine voles and present less risk to the applicator. Zinc phosphide is formulated at 2 percent active ingredient and has a safety rating of R, which means that it is acutely toxic to all vertebrates. It may be hand placed in active runways or broadcast into vegetation with a mechanical spreader at 10 pounds per acre. Most vole activity is associated with green grasses. Meadow voles prefer the taller, clumping grasses such as fescue and orchard grass. Baits should be applied in the green grasses where the voles stay, not onto bare ground. This is also true with pine voles because they will come to the surface at night in the green vegetation to feed. If a herbicide strip is under the drip line of trees or shrubs and there is a thatch present, the rodenticide should be applied in a band 3 to 4 feet wide in the edge of the green grass. Hand placement should be made in this same area. All broadcast applications of commercially prepared baits should be made with mechanical spreaders. Several are available. 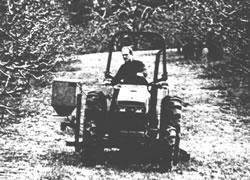 An example is the Cyclone model M38400R, which can be tractor mounted (Figure 6). A mechanical spreader can be calibrated easily to distribute the pelleted rodenticide uniformly. All spreaders should be calibrated before use to ensure that the correct number of pounds of bait per treated acre will be spread. Calculate treated acreage as shown in Figure 7. All rodenticides are designed to kill mammals. Take all reasonable precautions to prevent exposure to humans, pets, and nontarget mammals, birds, and fish. Figure 6. Broadcast application of rodenticide pellets. Figure 7. Calculation of treated acreage and broadcast rodenticide application. Helpful reviews of the manuscript were provided by C. R. Unrath and J. G. Vandenbergh. The photos of the voles and Figure 2 were reprinted with permission of the Virginia Cooperative Extension Service.